“We are all trying to be brave for those we love and for ourselves,” said Chief Brave Officer Stephanie Hansen. Fifteen months later after her mom’s successful treatment, Bravelets™, her collection of cause-related bracelets for men and women are available in three designs and 21 colors representing more than 80 causes. Each Bravelet costs $35.00 and each is engraved with the word, “Be Brave.” “Donating to a cause dear to your heart is so great but nothing can compare to the feeling of giving a loved one hope with this symbol of bravery,” said Bravelets Community Manager Alex McQuirter. On their website, they have created Brave pages, custom pages for your charity/cause/fundraiser. 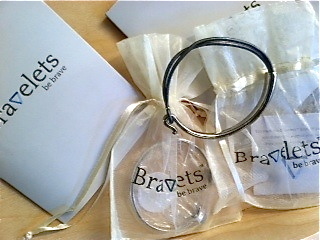 Your Brave page allows you to sell Bravelets products, and the donation goes directly to your cause! A few of the many worthy causes include Alzheimers, Leukemia, Breast Cancer, Lupus and Parkinson’s Disease. For PD, there are 27 different items on the site that are offered by organizations including Michael J. Fox Foundation, and Parkinson’s Disease Awareness. In addition to supporting your cause by sharing a “Brave” story on their site, you can also check out their Facebook page. https://www.facebook.com/Bravelets. We’re ever so appreciative of this wonderful company with a great cause that donated three bracelets to the Parkinson’s Women Support Holiday Bazaar. Be brave!